One of the biggest—and most dreaded—tasks of moving to a new home is packing up all of the belongings in your current house. Not only do you need to go through the process of sorting out what is going with you and what will end up at the curb, but you also need to consider exactly how you are going to get your items to your new home. Packing for a move is about more than throwing whatever is nearby into a box and taping it shut. You’ve spent a lifetime gathering your belongings, and you need to ensure that they are packed appropriately to survive a household move—which requires high-quality packing materials. The first step in packing your belongings securely is having the materials on hand to get the job done right. After you’ve decided what you need to pack, you need to consider each item’s size, fragility, and whether it will go in your personal vehicle or in the back of the moving truck. Packing Paper: Packing paper will be used inside the boxes to wrap breakables and line the top, bottom, and sides of the box interior. You’ll be surprised how much packing paper you use, so it’s smart to purchase a bit more than you think you’ll need so you don’t run out mid-way through the process. 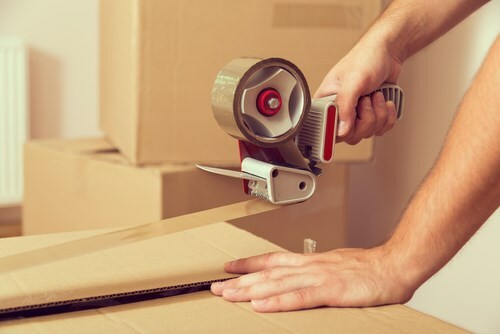 Cardboard: If you have old boxes that are only good on a couple of sides, these are perfect for breaking down into cardboard sheets for packing. You can use these pieces of cardboard to cover glass mirrors or as a barrier between stackeditems inside the boxes. Plastic and Bubble Wrap: Plastic wrap and bubble wrap are packing essentials! Use plastic wrap to secure moving blankets, bundle items, wrap dressers, and keep dust away. Bubble wrap is perfect for extra cushion and protection of electronics and highly breakable items. Furniture Blankets: Yes, you’ll also need to consider how to pack your furniture for a move! Moving blankets can be easily secured over upholstered furniture to provide extra padding and prevent damage to the material. Boxes:You need quality boxes to pack up your home, and it is best to stick with new boxes when possible. If you are reusing a box, make sure that it doesn’t show any damage. There are several types of boxes available for the different needs of a move, and you can find specialty boxes for hanging clothing, pictures, dishes, mirrors, and more. What Other Ways Can You Protect Your Packed Belongings? Take an inventory of your household goods before you start packing. There are free apps available to make this process easier, but a simple spreadsheet can help you keep track of all of your items. Purchase moving insurance, particularly if you are moving fine art, jewelry, and other valuables. Check with your home insurance agent and moving company to learn more about your insurance options. Keep your items secure by purchasing quality locks, transporting your high-value items in your own car, and safeguarding the moving truck. By following these guidelines, you will have a much better chance of making it to your new home with your items all in one piece—but what do you do when you know that you just don’t have the time to get the job done right? That’s where a residential moving company comes in, and hiring a mover to handle the packing of your home can streamline the process, help guarantee safety, and give you peace of mind by eliminating the stress of packing. At 495 Movers, we offer full-service moving solutions—including professional packing services! Whether you need fragile-only packing for a local move or whole-home service for your long distance moving project, we have the expert crews, free moving materials, and affordable pricing you need. Call today, and we’d be happy to tell you more about our packing, moving, and storage options, or fill out our online form now to request a free quote and consultation!